Welcome to my March 2012 income report! Every month I write a detailed report sharing exactly how much I’ve earned online and where it comes from. This isn’t all about the numbers though, it’s also about the journey, so I always make sure to include the latest going-ons within my businesses and the lessons I’ve learned along the way—good and bad. I do this not only to motivate you and to be transparent, but I also feel that if anyone is talking about making money online he or she should let their readers decide on what to do based on legitimate results, not on hype, exaggeration or inflated truths. That’s why I’m never afraid to tell you up front, especially if you’re new to online business, that none of this is easy and none of it happens overnight. The first monthly income report I published back in October of 2008 totaled $7,906.55—but what most people fail to realize is that the site where that eBook was sold (greenexamacademy.com) was up and running for nearly 2 years prior. Those two years were spent struggling through the technology, writing all the content, building connections with other people in the industry and most importantly, becoming a trusted authority. A lot of blood, sweat and tears went into building that business, and any other successful business that I own, but it’s all about putting in the hard work now so you can reap the benefits later. I hope you enjoy this month’s report. March was an event-filled month, to say the least. My Response to Timeline for Facebook Pages. 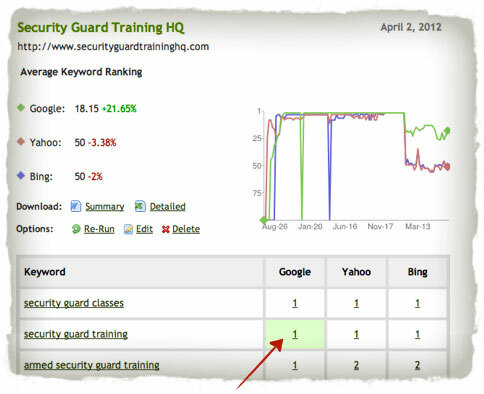 SecurityGuardTrainingHQ.com losing it’s #1 spot in Google after 492 days at the top. The product I was supposed to launch here on SPI. At the beginning of March, I learned that Facebook was forcing all pages to switch to the new Timeline format. Before the switch, I had the number one tutorial on YouTube and in Google for setting up a Facebook landing page and I held a relatively high-ranking spot for how to setup a Facebook page in general. In total, those tutorials amassed over 600,000 plays on YouTube and about just as many page views on the blog. I knew I had to create another set of tutorial videos for the new Timeline format, but I also knew I was going to have my work cut out for me. It took me awhile to wrap my head around the purpose of Timeline and how it worked, but after about 20 hours I had reformatted my own page, finished 2 tutorial videos and wrote a blog post about it, and that’s when I published Timeline for Facebook Pages: THE COMPLETE GUIDE, and so far it’s had an amazing response! After just 2 weeks the tutorial has earned 650 likes, 350 tweets, 200 comments, and over 14,000 total video views. More importantly, I’ve already had a ton of emails from new readers of the blog who said they found me through the new videos, and I received a few messages from fellow bloggers who said they were thinking about creating a tutorial of their own, but I beat them to it and they would rather send their traffic to me instead. Thank you all for the amazing and encouraging response, and I will continue to update that post as I learn more tips and tricks for the new Timeline format. In late 2010 I started an experimental niche site at securityguardtraininghq.com. My goal was to get it to #1 in Google and monetize it. In 73 days it got to #1 for its primary keyword and it has earned upwards of $2,500 per month since then. I publicly documented, in detail, how this site was built (click here to start from the beginning), even revealing the niche and the domain name, so it was no surprise that after some time a bunch of other people would enter the niche too. Still, I was able to hold my #1 position…until this past month. Lots of questions came to mind, of course. 1. How was this drop going to affect my traffic? For any keyword, there’s a big difference in click-through rates between the first and second result. It’s said that on average about 42% of people click on the first result, and only 18% on the second. That’s a HUGE difference! You’d expect a huge drop in traffic, but fortunately for me my site is very content heavy. As a result, most of my traffic comes from long-tail keywords, not my primary keyword. In other words, I knew the drop wouldn’t affect my traffic too much. My target keyword makes up only 14% of my overall search engine traffic, so even if I were to disappear entirely from the first page, I’d still have over 5000 different keywords drawing in traffic. Most just get 1 or 2 hits, but they definitely add up. 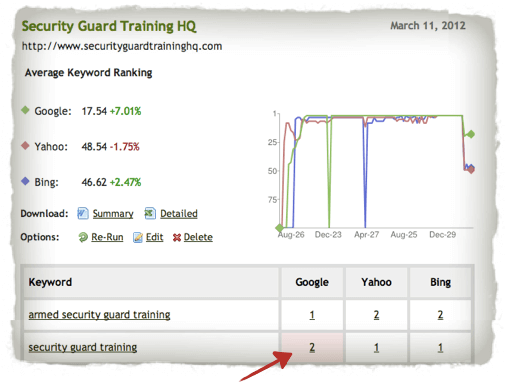 In February, the target keyword, security guard training, brought in 2,365 visitors, or 11.27% of my overall traffic. 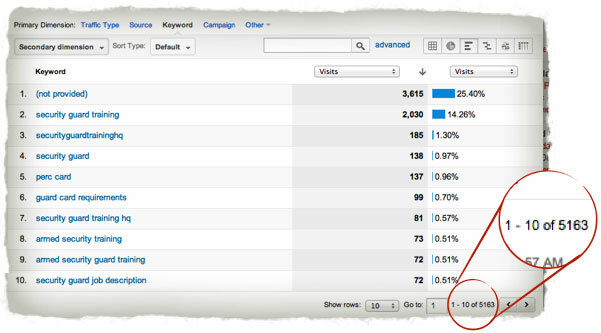 In March, it brought in 2,057 visitors, or 9.85% of my overall traffic. Not too much of a difference. The lesson here is that the more you publish, the more chances you’ll be found in the search engines—and if you can make that content extremely relevant and unique, what happens to your primary keyword doesn’t matter too much. Something to think about, especially if you’re in a niche where you just can’t seem to break through to the top spots in Google. 2. Did I do something to trigger the drop? 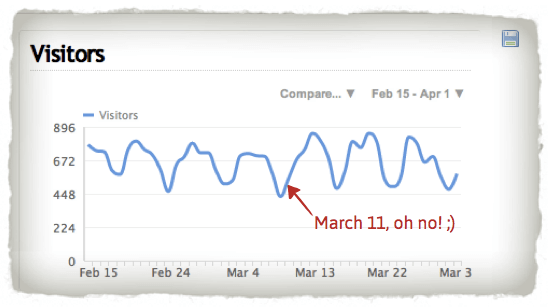 You might think that my site took a big hit because of the recent de-indexing of blog networks like Build My Rank, but that happened a week later on March 19th. I was already comfortably sitting at #2 at that point. Also, blog networks were not a significant part of my backlinking strategy, and as such I didn’t really see any effects from Google’s recent moves. Besides that—the only other significant thing I did was add banner advertisements to the site, but could that have affected my rankings? I had never heard of anything like that happening before, but when I checked to see what kind of site was outranking me, what happened became very apparent: I didn’t do anything to trigger a drop in the rankings—another site was created and was considered more relevant, and thus took the #1 spot in Google. 3. Where did this site come from? The fact that I was outranked after such a long period of time didn’t really bother me, and I would welcome a site in the #1 position that was better for the end user. That means I would have to step up my game a bit, and that’s fine—that’s what it’s all about. But after looking at the site for 5 seconds, it was obvious that something fishy was going on. It was created in November of 2011 and it shared the exact same domain as mine—except for one additional character. Further more, a couple of the keywords in the metadata are “pat flynn” and “smart passive income”. Plus, it had earned over 2,600 likes on Facebook and my backlinking analysis was definitely “very interesting”, especially for only being live for about 3 months. And was it built for the end user? No. It seemed like it was built just to outrank me. All of my thoughts were confirmed when the owner of the site publicly left a comment on my blog last week saying he created the site as an experiment just to see how long it would take to outrank me. Say what you will about the situation—I openly revealed my niche and my domain so something like this was bound to happen eventually. That’s a risk I was willing to take in order to teach this stuff to you. All I have to say is that this book could really help a lot of people and how they approach their business. 4. How could I get the #1 spot back? I hadn’t done any backlinking for over a year (yeah, it held up for that long! ), so I could start to do that again. Google loves fresh content, so I could post more relevant articles on the site. I could speed up the site a bit—the page load time isn’t fully optimized yet. I could also start to garner a more active community, one that may share the information on the site more often so it becomes more of a social factor. I took back the #1 spot! Who knows how much time and money was invested in his efforts to finally outrank me—I’d rather continue to do what I do. Enough of that—let’s get to the income breakdown. I’ll talk about point #3 at the end of this report. Major expenses this month include virtual assistants (one full-time, one part-time), hosting account for SPI (dedicated server), hosting for other websites, recurring payments for various tools, attorney and CPA (Certified Public Accountant) fees. It’s really nice to see some new niche sites start to finally gain traction, one of them being an amazon affiliate product site which is a nice addition to my diverse portfolio. Also, the site that I purchased is still holding strong after 2 months, even though I haven’t done anything to it except add Adsense ads. I’m still testing a few things before I make changes and “reveal” it and everything I have done and plan to do with it. My Adsense earnings for securityguardtraininghq.com did drop a bit, but it wasn’t because of the drop in rankings. As I said before, the traffic was virtually unaffected, as was the number of Adsense impressions on the site, but for some reason the cost-per-click (CPC) has decreased significantly. For what reason, I’m not sure, but I’ve been testing other forms of monetization on the site (banner ads and a new ad network—media.net), so maybe that impacted the CPC a little. Again, I’m not totally sure, I’m still investigating. It may be as simple as it’s just not a popular time for companies in the industry to buy and bid for advertisements, and when ad costs are lowered, so is the payout to publishers per click. Still though, I’m excited that my non-SPI related earnings continue at around $10,000 per month, with more sites in place to hopefully take that number higher, however that $10k is definitely overshadowed by my affiliate earnings. I’ll be the first to admit that a significant portion of my total online income comes as a result of blogging here on The Smart Passive Income Blog—mostly from the products that I recommend as an affiliate, which are products I’ve used or am extremely familiar with and have helped me in one way, shape or form. I’m so fortunate to have the support of an amazing community here who sometimes makes purchases through my affiliate links. some people going way out of their way to make sure they do that. With this comes a responsibility to the community that I know I have and will never take for granted – and as such I never promote just for the potential income that can come from an offer, even though those opportunities are definitely there. I usually end my income reports with what I’ve learned, but I wanted to do something different today. I want to be open and talk about my product. Don’t worry, there’s no pitch here, because there’s nothing to sell. You see, over the past 8 months I’ve dedicated hundreds of hours developing a niche site course—an extensive high-quality online program, better than any other I’ve seen before, similar to the coaching courses I ran last year that have helped several people create their own successful niche sites (and a couple people quit their 9 to 5 jobs too). My goal was to launch this product by March 15th, 2012, but due to the recent changes in the world of SEO and the fact that things still seem to be in a transition period, I have no choice but to hold off on any sort of launch and reassess the course material. This may require several more months of testing before I can be confident enough to launch a new version of the product, if I ever do. I put so much hard work into it and was extremely happy with the end result, but with something like this I have to be 100% confident in the product before ever putting it out there for sale. “It probably works” isn’t good enough for me. I know I hold a lot of authority in this space and have the opportunity to pull off a six-figure launch, but with that comes great responsibility and I always have to think about the end-user first, not my bank account. Doing that has always provided me with the better outcome in business and in life, so although I’m bummed, I know it’s the right move at this point in time. I know a lot of you were waiting for that course since I’ve dropped hints about it here and there for the past 6 months—but I hope you can see why I’ve decided to hold off on it at this point in time. Thanks for your understanding and for all of your support. Despite all the craziness of March, I had an amazing month of earnings and experienced a ton of growth, so I can’t really complain. Cheers, and here’s to a safe, happy and profitable April! p.s. if you’re interesting in going to Blog World Expo in New York this year, I’ll be speaking 3 times (2 panels and 1 solo presentation), I was able to get a special discount for SPI readers. Just use my referral link (I do get a commission from this) and use the coupon code SPIBWE10 in the shopping cart to get 10% off the ticket price. Cheers!